"Soul Calibur 2... it's finally here!" Soul Calibur 2 is the tale of a group of warriors who are searching for the legendary sword of power called the Soul Edge. Although the most powerful weapon in existence, the sword has a terrible secret that corrupts anyone who wields it. Only true and noble warriors can wield the soul edge without them being engulfed in its nefarious powers. Familiar faces from the first game return such as the beautiful Ivy and many new faces such as the deadly Dante or the PlayStation 2 exclusive of Heihachi (Tekken 4), the demonic Spawn (XBox only) and heroic Link from the Zelda universe (GameCube only). 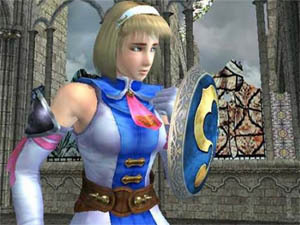 Unlike other fighting games, Soul Calibur isn't just reliant on hand-to-hand combat but rather each character has their own unique weaponry that can be used in the game to inflict some devastating damage or as a weapon of defence. The amazing thing of Soul Calibur 2 is that each character has over 130 different moves that include attacks, parries, throws, special moves, counter-moves and a variety of other attributes. Soul Calibur 2 is not just your average button masher but far from it actually and is probably the most detailed and involved fighting game in existence. The gameplay of Soul Calibur 2 is simply amazing and there is virtually a plethora of different moves that your characters can engage in. The different types of gameplay modes include the Weapon Master, Arcade, Versus and the practice mode. Most of the modes are relatively straight forward but the Weapon Master Mode is the story mode for Soul Calibur 2 and unlocks each characters story, weaponry, costumes and allows you to level up your characters. Soul Calibur 2 has over 15 different characters that range from a few familiar faces from the first version of the game on the Dreamcast to the PlayStation 2 exclusive Heihachi, who was the boss character in the Tekken series. The strange aspect of Heihachi when compared to the other characters of Soul Calibur 2 is that he is the only character that does not have a weapon. 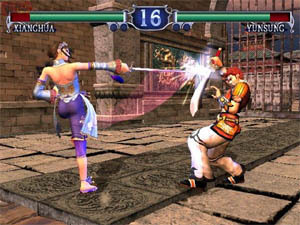 The combat of Soul Calibur 2 is perfect and uses a combination of hand-to-hand combat and weaponry. The characters are controlled via the analog stick with the shoulder buttons and d-pad used to engage the enemy with your fighting skills. There is virtually thousands of different moves that are contained in this game from kicks, sword slashes, holds to a variety of special moves. 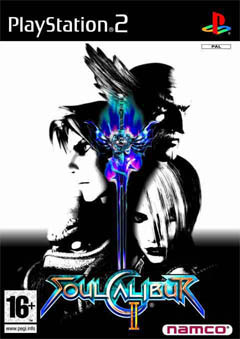 The multiplayer aspect of the game is sheer brilliance and allows gamers to fight against other gamers with their favourite characters. If gamers love the same characters, then don't fret because the developers have also included different costumes and colour schemes for your favourite characters. Graphically, Soul Calibur 2 is quite simply a visual treat that contains some of the nicest and smoothest graphics to have landed on the PlayStation 2 in a long time. Firstly, the backgrounds of each level are simply amazing and are extremely detailed, colourful and sometimes have a variety of things happening on screen at once. The little touches in the game such as the water effects, the skyline and dirt are realistically implemented into the game for that extra touch. Lastly, the most impressive thing about Soul Calibur 2 are the gorgeously created characters that are extremely detailed and contain a high level of polygons for that realistic look. Add some detailed textures to these polygon characters and you have a match made in fighting heaven. The characters also move with fluid like grace when they fight each other and even the small touches such as moving hair and clothes has been added to the characters to ensure that this is the nicest looking game on the market. 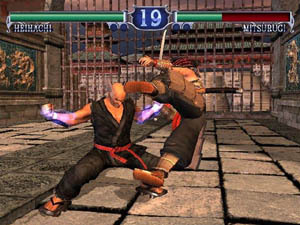 The game also contains a variety of special effects such as motion blur and a variety of other effects that include realistic fire and water movements. With a gorgeous ingame engine, beautiful CGI created cinemas, Soul Calibur 2 also supports progressive scan for those PlayStation 2 owners that own high definition televisions. The musical score of Soul Calibur 2 perfectly suits the game in that Hong Kong style movie genre that not only combines the majestic feel for the hero characters but also the darkness that surrounds the villains in the game. The sound effects also sound brilliant with the sounds of metallic weaponry hitting other weapons for that steel on steel sound. The battles themselves also feature the sounds of characters using their hands and feet to inflict damage and some brilliant yet cheesy voice acting that all comes together perfect for Soul Calibur 2. The extremely cheesy announcer from the previous game has also returned to plague another generation of gamers. In conclusion, Soul Calibur 2 is simply brilliant and is probably one of the best fighting games that I have ever played. With over 200 weapons that are included in the game with 5 new characters to unlock and a variety of different fighting skills, Soul Calibur 2 will be one of those games that you will keep playing and playing. A must own!